Stella Doufexis was born in Frankfurt am Main and studied at the Hochschule der Künste, Berlin, with Professor Ingrid Figur. In addition to masterclasses with Aribert Reimann and Dietrich Fischer-Dieskau, she now studies with Anna Reynolds. 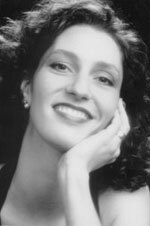 From 1995 to 1997 Miss Doufexis was a member of the Theater der Stadt Heidelberg where her roles included Cherubino, Hänsel, Nicklausse, Gluck's Orfeo, Rosina, the first German staging of Birtwistle's The Second Mrs Kong and the Philip Glass/Doris Lessing Die Ehen zwischen den Zonen 3, 4 & 5. Operatic engagements have included Die Zauberflöte with the Theatre Royal de la Monnaie, Brussels, Haydn's L'Isola Disabitata at the Deutsche Staatsoper, Berlin, an acclaimed Octavian in Der Rosenkavalier for Scottish Opera and Meg Page in Falstaff under Claudio Abbado in Ferrara (also televised). An acclaimed recitalist, she made her debut at London’s Wigmore Hall in Graham Johnson's 'International Songmakers' series and has appeared in recital at the Cologne Philharmonie, the Berlin, Lucerne and Schleswig-Holstein Festivals, Frankfurt Opera, the Schubertiade, Hohenems, and in Brussels, Vienna, Athens and at the Ruhr Klavier-Festival. In concert Stella Doufexis has appeared with both the Stuttgarter Bach Akademie and the Israel Philharmonic under Rilling, the Munich Chamber Orchestra under Christoph Poppen, the Ensemble InterContemporain under David Robertson, the Gustav Mahler Jugend Orchester under Kent Nagano and the Deutsches Symphony Orchestra, Berlin, under Vladimir Ashkenazy. In the United Kingdom she has appeared at the Aldeburgh Festival and the BBC Promenade concerts.